One way that I was able to save a lot of money for my wedding was with DIY projects. This included programs, table numbers, and place cards. 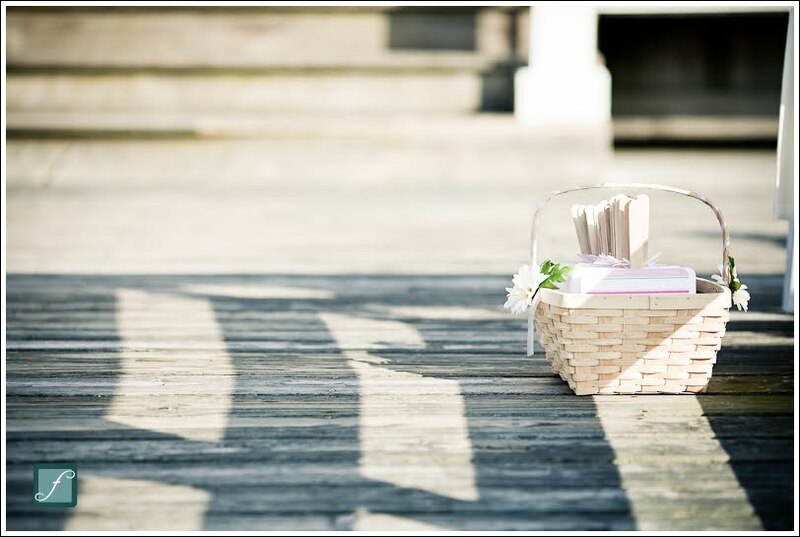 Many brides may have a hard time deciding what kind of program they want, whether it is the traditional program or something a little more different. For my wedding I found a fun "fan program" on The Knot and decided I wanted something similar. One afternoon my bridesmaid JC came over and I showed her the picture and she worked on Adobe PhotoShop to recreate the fan design using my colors and information. After I was happy with the final design, we went to Kinkos to get price quotes to find out how much it would cost to print out 150 color copies (75 color pages front and back). For some reason we were shocked to find out it cost almost $1.50 a page! Or about .75 cent if we supplied our own paper. Outrageous!! Simply OUTRAGEOUS! My programs would have cost me over $200. I said, "No way!" JC and I then put our heads together and a thought came to me..."Hello?! You have a photo printer at home for this kind of project! Do it yourself!" So away we went to Michael's arts and crafts store where we purchased 150 sheets of white cardstock (50 in each pack at $4 each). Then we went home and began the process of printing out all of my programs. Somehow we managed to print out all 150 sheets (75 programs) without having to buy new ink cartridges. I couldn't believe it. We printed out my programs for $12. I later purchased a $10 corner rounder punch, a few spools of ribbon for $1 each, and a box of jumbo popsicle sticks for $10. The overall cost of my programs was $35! While the time and effort it took us to put them together (I called in help from my other bridesmaid Becca as well) totaled about 4 hours, it was still worth it. 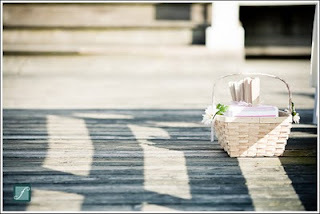 They were, hands down, the favorite part of my wedding ceremony.From there I purchased two $5 baskets that we wrapped in ribbon and added flowers to the side, and this is where we put the programs. The second DIY project we undertook were small organza bags filled with pink and green M&M's (the M&M's said "Pamela & Drew" and "4-17-10"). These bags had a small tag attached with the person's name on one side and their table number on the other. I used my awesome pink Cricut machine to die cut 150 cream circles, 38 green circles, and 38 pink circles. 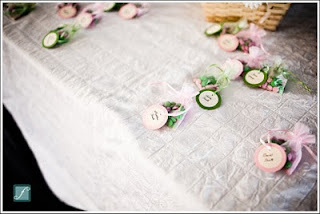 We then put the circles together to match the green/pink bags and had Becca's boyfriend use his beautiful handwriting to hand write each guests name. Then we punched a hole in each circle and tied them to the candy bags. These bags were placed on the table at the entrance, right next to the guest book. Each guest came in, signed the book and grabbed a bag with their name on it. This was the easiest part of our table design. I went into Microsoft Word and typed in the numbers 1-15, all spaced out evenly. Then we printed two copies of the numbers, printed them out on left over program cardstock and cut them into even squares. 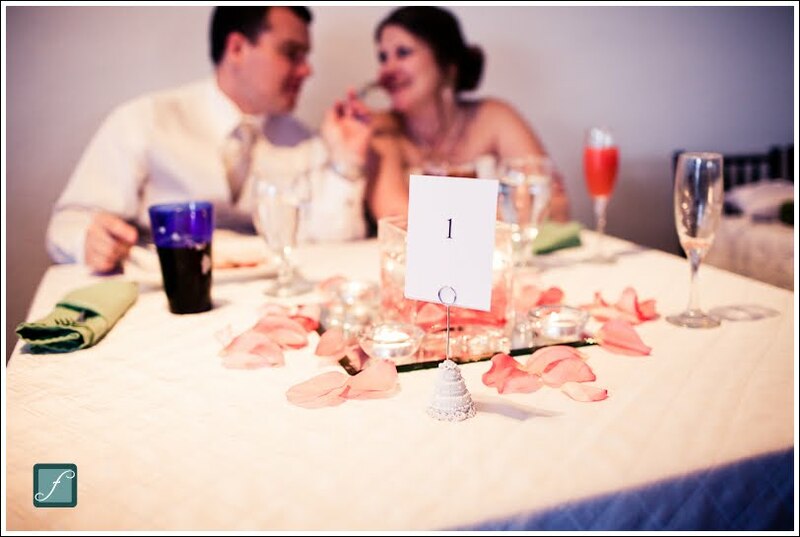 These table numbers were placed into holders that we purchased online for $1 (total of $15). We put a lot of thought into what we wanted to give out as our gifts/take-aways. I love photos and picture frames and the theme of our wedding was revolving around a heart. We found mini silver photo frames with a double heart on the top that we thought were adorable. We purchased 75 of these (they were about $1.25 each) and used them not only as our gifts but our table place cards as well. Once a guest picked up their candy bag with their table number, they then walked to find their table. On the table was a picture frame with their name on it to show them where to sit. The card on the inside said "Thank you for sharing our special day. Love Andrew and Pamela." And then the person's name in bold. We printed these cards out on business card paper, tore them apart and taped them into the frames. They served two purposes and were well worth the money! We were able to save a lot of money by doing these DIY projects on our own. 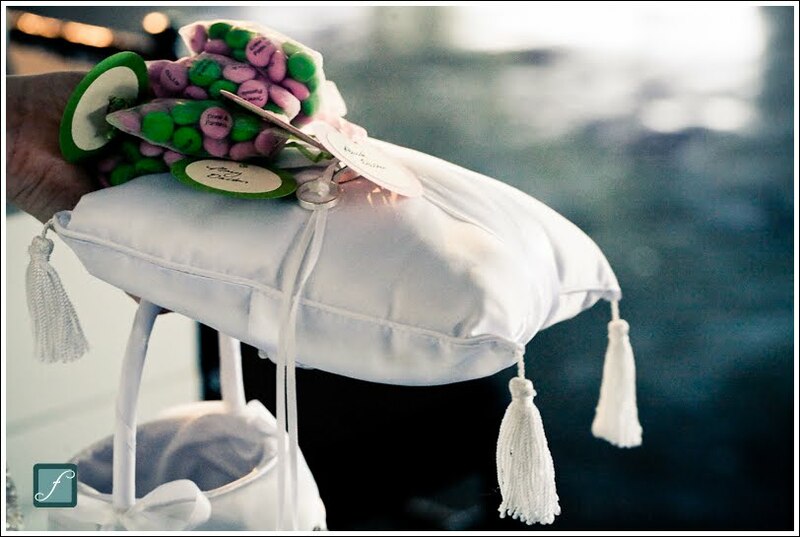 These home made parts of our wedding were some of my favorite parts!